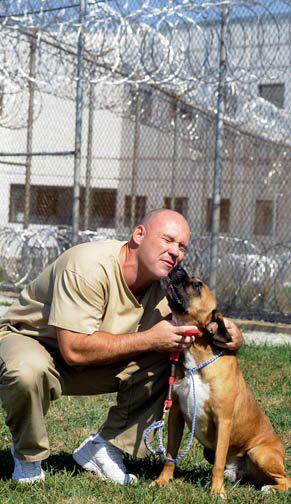 Canine CellMates is a jail dogs program that operates out of Fulton County Jail, in Atlanta, Georgia. The 8-week program pairs a Fulton County Jail inmate with a Fulton County Animal Shelter dog so that through their relationship they can help rehabilitate each other. The goal of the program is to save more dogs by training them to be better pets and help inmates become better citizens. 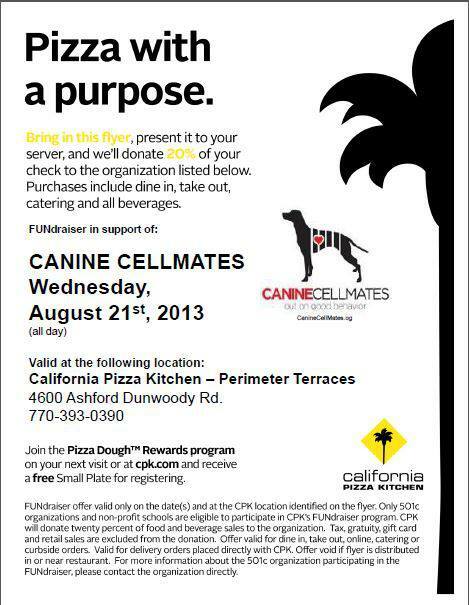 Canine CellMates has partnered with California Pizza Kitchen (the Ashford/Dunwoody location) and is holding an event tomorrow, Wednesday, August 21, 2013 called “Pizza with a Purpose” in which patrons bring in the flyer (Canine Cellmates CPK Flyer) and 20% of their check goes directly to Canine CellMates. Canine CellMates give the inmate a productive new sense of hope and newly trained skills to care for and train shelter dogs, and give the dogs the skills they need in order to become adopted into and spend the rest of their lives in loving and caring homes.The mission of Canine CellMates is to establish a continuing partnership between Fulton County Animal Services, the Fulton County Sheriffs Office and Fulton County Jail, and Canine CellMates to rehabilitate inmates housed at Fulton County Jail and homeless dogs from Fulton County Animal Services through a Good Behavior Incentive program. The incidence of violent outburst in prison and jail facilities where these program are in place has shown a dramatic decrease, sometimes as much as 50%. Recidivism rates have also shown marked improvements. The Atlanta metro area has one of the highest recidivism (or re-offend) rates in the country, around 70% within the first 2 years after release. In Gwinnett County, over 300 inmates have gone through this program to date, and only 6 or 7 of them have since re-offended, which is roughly 2.3%.